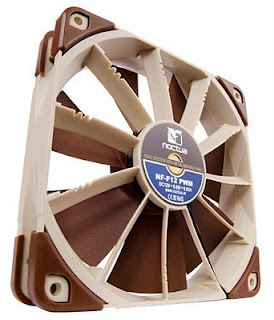 Vienna, November 9th 2011 - Noctua today introduced the new NF-F12 120mm Focused Flow fan. Teaming up eleven stator guide vanes with a specially conceived seven blade impeller, the NF-F12 s Focused Flow system creates outstanding static pressure and focuses the airflow for superior performance on heatsinks and radiators. At the same time, a wide range of advanced aerodynamic design measures, second generation SSO-Bearings and Noctua s new, custom designed PWM IC for fully automatic control guarantee astounding quietness of operation. "Our award-winning NF-P12 has become a standard choice for pressure demanding applications such as CPU coolers and radiators, but we ve been striving to achieve even better performance in this domain, and this is how the NF-F12 was born", explains Mag. Roland Mossig, Noctua CEO. "Due to the stator guide vanes focussing the airflow, it can push the air through dense fin stacks more effectively. This type of design has mostly been used for noisy high speed fans so far, so our engineers have put a lot of thought into keeping the noise in check." The NF-F12 uses a wide range of aerodynamic optimisations in order to refine the fan s acoustic qualities. For example, the NF-F12 s stator guide vanes are set out in Varying Angular Distance and feature Vortex-Control Notches. Both measures help to spread the noise emission over a broader frequency spectrum and thus make the fan s sound pattern more agreeable to the human ear. Another novel measure introduced with the NF-F12 is the Stepped Inlet Design, which adds turbulence to the influx in order to facilitate the transition from laminar flow to turbulent flow. This measure reduces tonal intake noise, improves flow attachment and increases suction capacity, especially in space restricted environments. In addition to its advanced aerodynamic features, the NF-F12 is the first fan to implement the further optimised second generation of Noctua s renowned, time-tested SSO bearing as well as the novel, custom designed NE-FD1 PWM IC for fully automatic PWM speed control. The NE-FD1 integrates Noctua s Smooth Commutation Drive (SCD) technology for quieter operation and allows for ultra-low power consumption: Drawing only 0.6W, the NF-F12 consumes more than 50% less than many fans in the same speed range. This doesn t only make it eco-friendly but also cuts down the electricity bill. Last but not least, the NF-F12 comes with modular cabling, integrated anti-vibration pads and two speed settings for full flexibility. Its commanding performance, exhaustive set of features and Noctua s trusted premium quality make it an elite choice for use on air coolers, radiators and other pressure demanding applications. The NF-F12 will be available immediately at a recommended retail price of EUR 19.90 / USD 24.90.